A vegan fried egg that tastes so very close to the real thing is something that I've been craving since I adopted a vegan lifestyle. 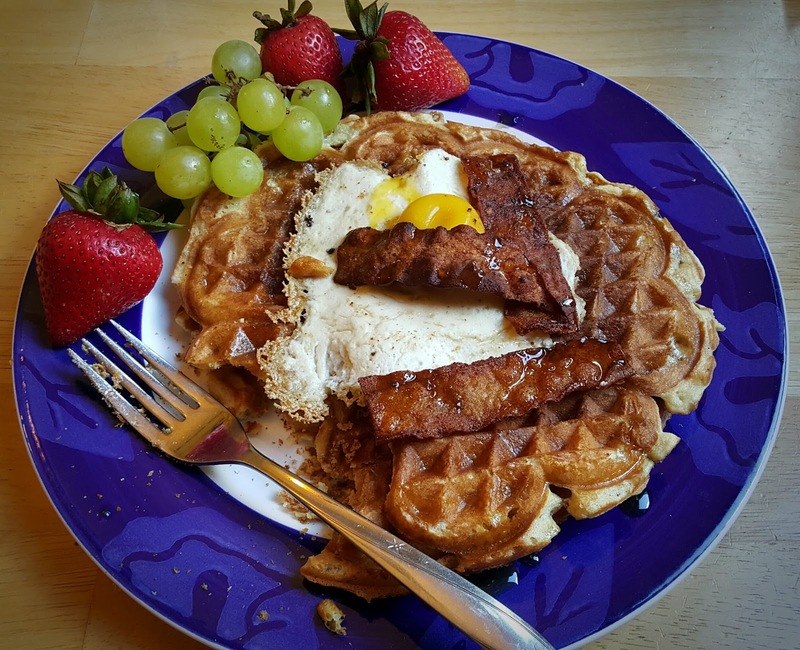 While I normally aim for a whole food plant based diet, I'm still a slave to cravings for comfort food like biscuits and eggs, and fried eggs on toast... or waffles! Unfortunately the recipes I found online were mostly slices of tofu, combinations of instant mashed potatoes or other starchy concoctions. 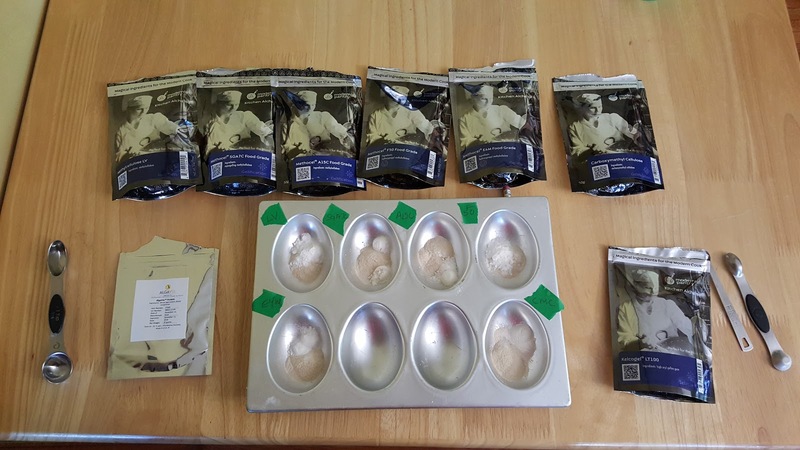 I spent a few months exploring eggs based on protein isolates and starches last year and the results were dismal, barely passing for the real thing. After a few fitful starts and a lengthy hiatus, I finally stumbled on a combination of ingredients that mimics what I was after. I recently purchased a new book on edible polymers, essentially hydrocolloids, called Cooking Innovations from amazon. It's a wonderful book if you're into cooking science, covering the basics of edible polymers and covers things like agar-agar, alginates, carrageenan, and all the cellulose derivates. Reading through it inspired me to purchase a few Modernist Pantry ingredients to play around with. One of those was something called E4M methocel. It was a somewhat random purchase, considering there are dozens of cellulose products on the site. My interest in it came from a patent I had read that used methocellulose to beef up things like marshmallows so that they would survive high heat. I wondered if maybe it could be added to aquafaba to help it survive higher heat in the oven for applications like angel food cake. When I got it, however, I was playing around with it and fried some in a pan out of curiosity. The solution of water and e4m was mostly clear when I poured it in the pan, but it immediately turned completely white like an egg white does. That was pretty awesome and got me started back on my otherwise abandoned fried egg kick last year. The problem with the methocel frying that way was that it turned translucent again as it cooled. Not good. I wondered if a special combination of the methocel with something else that starts translucent when heated and turns opaque as it cools might work. Agar agar came to mind, but the time to cool seemed prohibitive. It turns out there was something much better. In the beginning of this year, a product called VeganEggs from Follow Your Heart came out. It's essentially algal protein, a few forms of cellulose hydrocolloids, and something called gellan gum. I had seen gellan gum in just about all the faux vegan products on the market, and had read some pretty interesting things about it in the Cooking Innovations book. It's almost like a bunch of different hydrocolloids in one. The spec sheet on it isn't just a sheet, it's a veritable tome compared to information on similar products at almost 30 pages, and is well worth reading if you're using gellan gum for experimentation. Around this time, too, I saw a post form The Gentle Chef on Facebook saying that he had stumbled on a unique combination of ingredients which could be scrambled up as a vegan scramble. Excited by this announcement, I was able to set aside a week of time to play in the kitchen. I normally only get an hour or so every few weeks to experiment with vegan cooking science, so I wanted to make the most of it and figure out this fried egg business once and for all. It's usually a spark of an idea that pulls me into the kitchen to play around. I don't have a lot of time to experiment and can only do it occasionally. I haven't done anything with these eggs in over six months, due in part to some unavoidable circumstances, but also that I don't get more than an hour or so every few weeks to do much of anything in the kitchen. When I do, it's often a frenzied rush of scribbling in notebooks, snapping pictures, and trying to balance discovery with systematic investigation. It's a little bit of science, a little bit of art, and a lot of sheer dumb luck. Sometimes, something comes of it, often a lot of it ends up in the garbage. I know of a bunch of people that are in their kitchens trying out new things, experimenting, inventing, and playing around. For some, this is their livelihood, but for others it's more avocation than vocation, and it seems to me that there is an incredible amount of information that could be shared from those endeavors that is currently being lost. Most of the blogs in the vegan blogosphere are just the results of a long process. They're picture-perfect, often perfected, recipes. You don't see all the hard work that led up to that point, and so if there are other people on a similar journey, they're also making a lot of the same mistakes, wasting a lot of the same ingredients, enjoying a lot of the same frustration. I've setup a few Facebook groups with the intent of trying to get people to help share ideas, and but there's a deeper problem with the process, I think. The last run of these fried eggs took me about 10 days, working a few hours a day in the kitchen, but generated pages of notes and pictures that were snapped in a not-so-organized way. The time it takes to simply collate the information in those notes to present in a blog post or some other form would more than double the actual time in the kitchen, so I see why it's easier to just communicate the final results of an endeavor like trying to find a better recipe for something. That sort of rumination took me out of the kitchen again and I have spent the last six months thinking about a sort of research management app that would make the process much smoother, at least for me. It would aid in organizing and coordinating notes with pictures, and allow for quick edits like redacting certain things in the notes that I wasn't at liberty to share, etc. The idea was that it could be used for things like vegan cookery to help share the process with other people who are going through the process, in real time, and allow for collaboration in a way that simply isn't possible on Facebook or in any other apps that I've seen. It can't be something that gets in the way or it becomes useless. It would be far better than a collection of pictures, and a short blog post write-up, which is the best I can do for now: https://goo.gl/photos/bMBj1i67QZvZWM2g9. Taking a break also led me to a crazy awesome solution to the problems I was running into with making these eggs, such as the need to make the yolks separately. I'd start by taking a package of firm tofu and throwing it in the vitamix blender. The tofu is the base of the eggs. It provides the actual nutrition. The rest is flavor, structure, and magic. It works just as well with protein powders. I have one from ADM that has a few unobtrusive flavor profile that I like, and I've used it with blended cashews with some success. The tofu, however, seems to give the best structure and flavor. Then I'd get out the LT100 high acyl gellan gum, the E4M methocel, kala namak sulfurous salt, the package of super agar, the package of calcium lactate gluconate, the nooch, and the hand blender. Into the hand blender container, I'd put in 1/2 cup of filtered tap water, 1/2 tsp of the E4M, 1/2 tsp of the Calcium salt, 1/2 tsp of the black salt, 1/2 tsp of nutritional yeast, and 1/4 tsp of the agar. I'd add 4 tablespoons of the blended tofu to the mixture and blend it on high speed for about 30 seconds. The calcium salt and kala namak change the way the hydrocolloids gel in a way that I like, and the nooch gives it a deeper flavor, especially when cooked in oil. The only thing missing from that mixture is the gellan gum. The reason I leave it out initially is that at these amounts, the difference between 1/16th of a teaspoon can mean the difference between a mixture that blends like milk and one that is like dough. It's very sensitive. I also want to make a fried egg that's a bit more realistic. If you look at normal eggs, they have two whites. There's a more runny one on the outside, and a thicker one by the yolk. 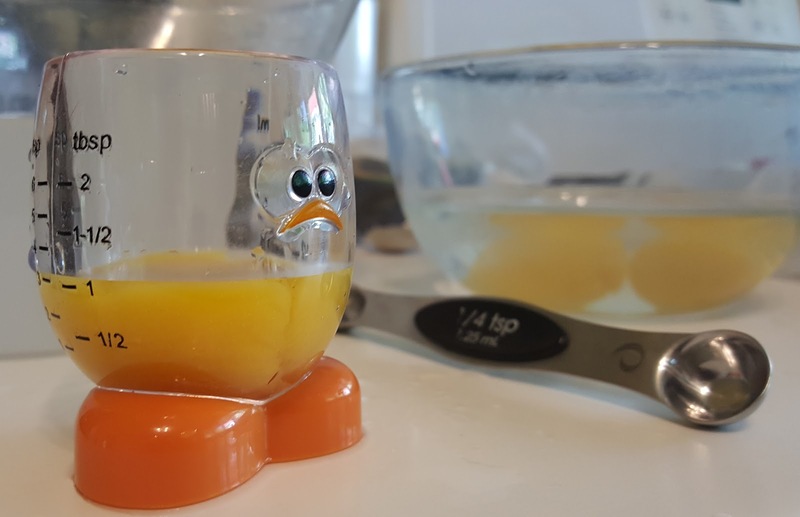 After everything but the LT100 are blended, I make the egg yolks using The Vegg, following the basic spherification video instructions on their site: https://thevegg.com/cooking-with-the-vegg/. I do it in a little egg cup to make it easy to swirl. 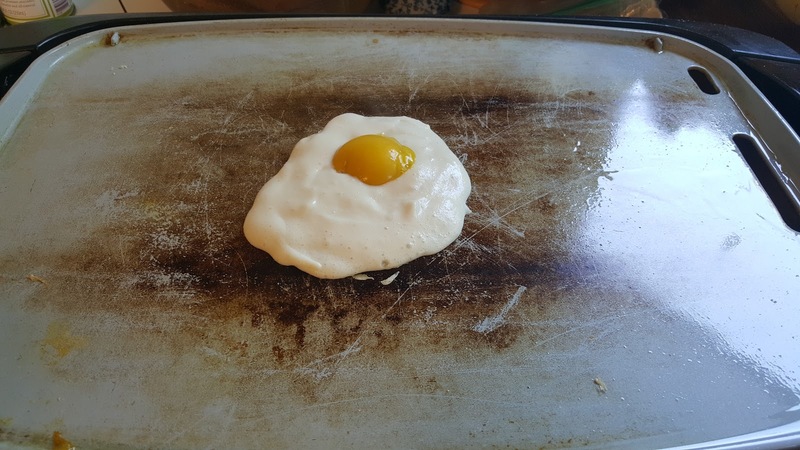 Then I blend in about 3/4 tsp of the LT100 gellan gum and either pour that right on a well oiled griddle, or put the sphericized yolk on the griddle and pour it over and around the yolk. This is the runny egg part of the whites. Once that's done, I put between 1/16th and 1/4 tsp of gellan gum into the container, 1/16th tsp at a time, blending each time, until it is just shy of not being able to blend any more. That's the critical phase where the egg white becomes super easy to flip and manipulate on the griddle. If it's too runny it sticks to the flipper when you try to flip it. If I go too far and the mixture is too thick to blend, it's fine to use, it's just not going to look good. The thicker dough-like consistency is actually better if you're looking for a kind of fried egg like you might find in a biscuit or muffin sandwich at a fast food chain. 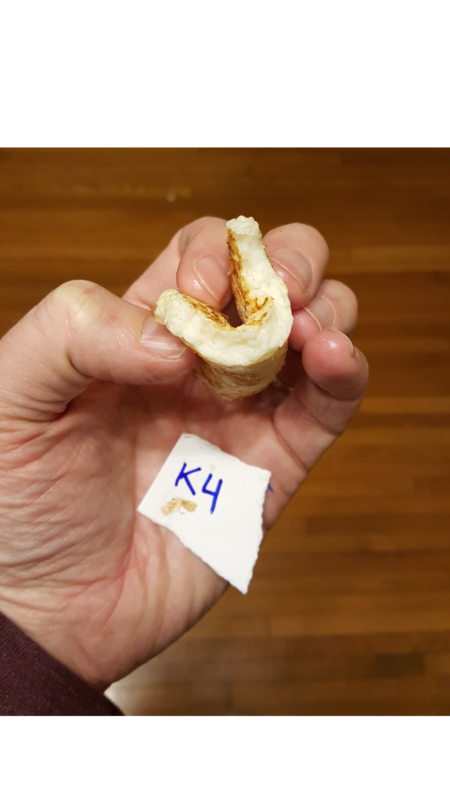 In the pictures of the notes in the album linked above, I show one (K4) that's almost 3/4 inch thick and is very pliable. It tasted very much like the fast food chain eggs. The two main ingredients are the LT100 and the E4M. Between the two, you can fine tune the final texture to suit. I add in the agar and calcium salts to finesse the process and make the final product a bit more realistic after it cools for a minute, but they're certainly not necessary. That's the process in a nutshell. That 1/4 cup of blended tofu makes about six large eggs. It would be really handy to be able to cook the yolk in a way that didn't require assembling the egg in three steps (outer white, inner white, yolk) wouldn't it? A few other interesting tidbits. During the experimentation to make these eggs I ran into a couple of other interesting things. 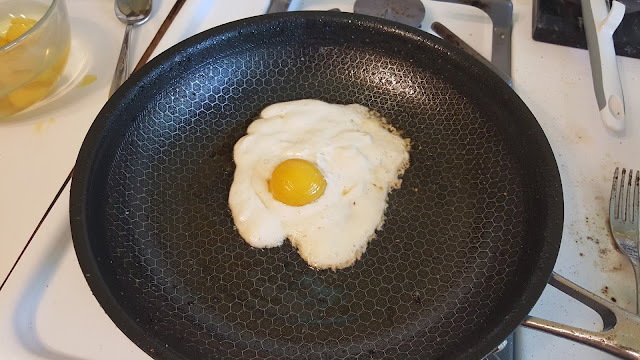 At one point I mis-measured one of the ingredients and the egg when fried ended up tasting nothing like eggs. What it tasted like was animal fat. In all the vegan products that I'm used, there is something missing. That mouthfeel/taste that you get from a certain omni dishes simply isn't there, in my experience. Plant oils just don't cut it. This stuff tasted just like it, in a way that was viscerally disturbing, and it sparked another idea. I love the laekon faux bacon that's all the rage now (https://www.youtube.com/watch?v=OvPvh30CDRU), but when I made it, my initial reaction was that it tasted a bit too much like deep fried cheese. It was very starchy, but missed a certain lipid profile that real bacon has and that you don't find in any of the store-bought faux bacons on the market. I spent a couple of days making a homemade version of the rice paper used in the laekon recipe and tried to duplicate the FAT that I stumbled on to get it into the bacon. The results were mixed. It definitely tasted better than the original recipe, but it looked awful. I need to find a way to make the "rice paper" in a more consistent way that marbles in the fat. It'll be awesome if I can find the time to work on it. Another interesting development happened at the tail end of the day. 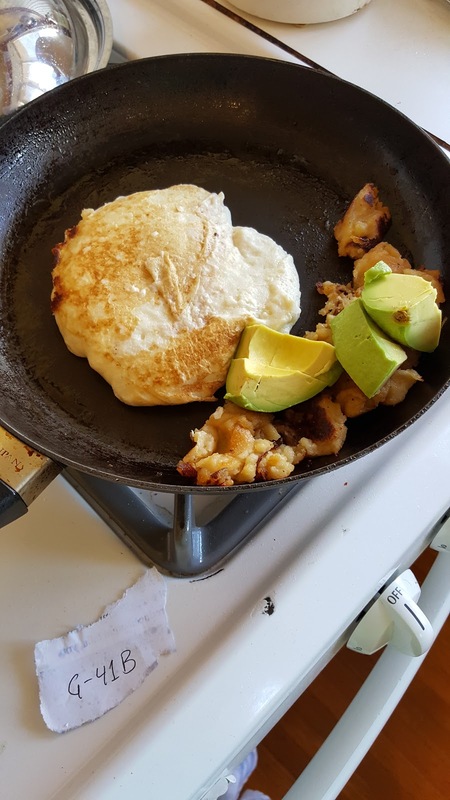 I wanted to see if the egg ingredients (without the water or tofu) would collapse the foam that aquafaba produces. Unfortunately I didn't record or measure what I put in, but I put 3/4 cup of aquafaba in a mixing bowl, and put in somewhere around a 1/2-1tsp of the ingredients that I would normally use for the vegan eggs. I don't remember if it was all of the ingredients or just some of them, or what the proportions were. At first it did collapse the foam. I was a bit bummed about using up the expensive ingredients, but then decided to add in more, thinking that it may be a problem with amounts and that surely I could force the mixture. I dumped in a bit more of everything and walked away. When I returned about 5 minutes later, the foam had caught and ballooned up much stronger and larger than the aquafaba foam by itself. I couldn't resist, so I whipped up a quick angel food cake and baked it. Here's the fun part. It actually worked. It didn't collapse. It was cooked around 375F. It pulled away from the pan a bit more than eggs would as it cooled, and I didn't take any care in trying to make it look nice, tearing into it the moment it was cooled, but the texture was spot on. There's some tweaking and systematic discovery that needs to happen, but at least I know it's possible now. There are more pictures in the album linked above. On a lark, I also put a bit of the meringue mixture on the pan next to the cake in the oven to see if it would survive the high heat. It, also, survived. The problem was that given the heat, it tasted more like marshmallow than meringue. And here's another interesting bit. The marshmallow taste was, to me, much more accurate than the commercial vegan marshmallows on the market. I love Dandies as much as the next person, but when you cook them over an open flame, they taste a bit like burnt sugar to me. 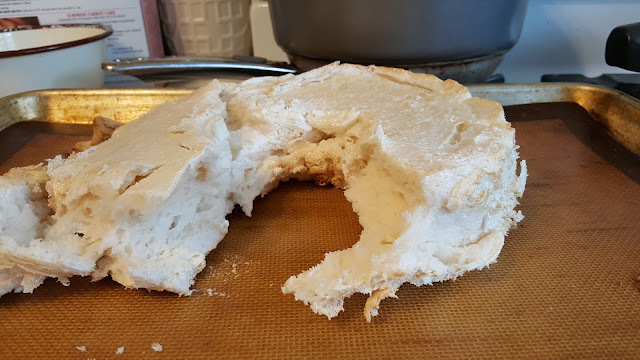 The marshmallows made of animal suffering, however, don't, and this overly baked meringue tasted a lot more like the non-vegan ones. There's definitely an opportunity there, I think. A few experiments showed that CMC (bottom right) is characteristically different than the rest. The same amount of liquid makes CMC much more runny than the others. The others can hold up to 4x more, and seem mostly interchangeable. If you wanted to use another cellulose, you can probably adapt this recipe to use another. There are others with signifiant talent exploring this space already, so I have no doubt someone will find a few simpler, more effective combinations. My hope, though, is that by publishing what I found, and making my notes available, even if I don't have the time to explain all the steps and logic behind each ingredient, it might help someone who's looking at playing with this stuff. I'm certainly not the only one on this vegan egg train. Thank you, that is very interesting and exciting. I love your experimentation and fantastically thorough methodology. Please keep this up! I feel very confused...yet inspired :) . I'll have to read through this again. Thanks for sharing all your hard work.